I’m taking a break from posting about my Halloween reads today because horror books seep into your subconscious and stay with you, I don’t want to rush any of the horror reads I have chosen, as I read primarily to enjoy myself and I completed my Goodreads challenge a few days ago and read the 170 books I pledged to read in 2015, alas it was only a guide and it definitely does not mean I’m not reading more. In fact I’m a little over my challenge now at 172 books and according to Goodreads 36 books ahead of schedule. So could potentially break the 200 books barrier this year. My book choices in 2015 have differed in that I have been more selective about choosing titles I will enjoy and less tolerant with picking reads out of a sense of duty. I still haven’t got to read all the award winning books from last year that I put on my wishlist but I am excited about the books I have chosen to read over the next few months of 2015. I am considering revising my review guidelines and perhaps doing away with review requests altogether but this is just at the pros and con stage, nothing I have decided for definite. I am delighted to have completed my Goodreads challenges for three years in a row and look forward to 2016 anticipating many more books I will love. Wow awesome with the reading. Super Jealous, don’t think I read anything near that volume. And yes review requests are things I am also thinking about as most of them veer me from my TBR lists. Although I wont lie I have read some awesome books through review requests. So yes view the pro’s and cons before you scrap it. Happy reading. Congrats, that’s an impressive amount of books! 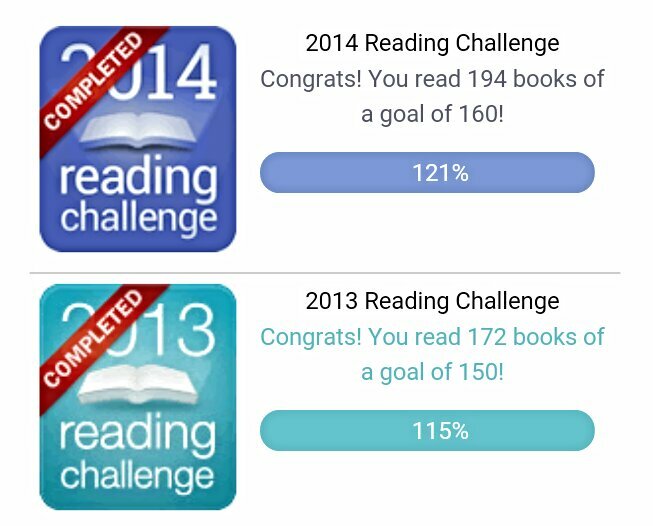 I finished my Goodreads reading challenge earlier this month when I completed my 74 books (my original challenge was 52 books but I increased it back in June when I was getting close to that number). It will be interesting to see how many books I actually complete by year’s end. Congratulations on finishing your challenge!!! Now you can just concentrate on enjoying your books without being concerned with numbers of books read. I always concentrate on enjoying the books I read or there’d be little point in reading. Goodreads is just a way to keep track and counting is a by product of that. I will never understand how you can read and review so many books in one year. Wow! I think I’ve always read books this way, but never counted before 2013. Originally I thought I must just read fast but I think it’s more staying focused for long periods of time. Also I think the more I read the easier it gets to stay focused. Congratulations on reaching your book goals 3 years in a row! The most I’ve read in a year was probably 120ish, and even then by the end of the year I can barely recall the specifics of some of the books I’ve finished. If it’s not unique enough, it tends to blur together with similar books in my mind, haha. Thank you. Some books are more memorable than others but luckily my reviews jog my memory if I can’t place a title. Omg! that’s fantastic. I can’t keep up sometimes. I’m hoping I will finish this year’s challenge somehow… few more to go. Btw, I’m not getting your posts… so have had to follow and unfollow. It annoys me when WordPress messes up my stuff. There’s still 2 months to go, I don’t usually finish the challenge so early, not sure why it’s gone so quickly this year. WordPress reader can be a nightmare. I swear, I sign up for posts to be emailed and somehow it is WordPress reader only – gah!